In recent years, artists have been interested in “slippage.” In painting, that often translates into an exploration of the space between abstraction and representation, or between two and three dimensions. “Unfinished,” the inaugural show at the Met Breuer, examines another important area – the gap between finished and unfinished. 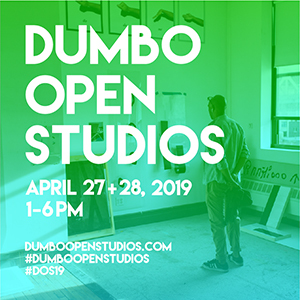 The exhibition features a wide range of unfinished objects and riffs on the well-established idea that artists don’t always complete their projects. In the earliest pieces, the unfinished paintings, drawings, prints, and sculptures simply aren’t done. Large areas may still be sketched in with no paint on the canvas, while others are waiting for the details to be incorporated. The wall labels explain each scenario, and we learn that the artists’ commission might have changed, the size may have been wrong, or other work took priority. In the Modern era, artists placed less value on the refined surfaces of previous generations, working wet-on-wet rather than using traditional underpainting and glazing techniques. Back then, audiences tended to feel that the new approach, pioneered by painters like Van Gogh, Cezanne, and Picasso, looked unfinished. But the Modern works on display in this exhibition – for example, an abstract Mondrian sporting early pencil lines, a Van Gogh canvas revealing empty, unpainted areas – may have been considered incomplete even by the artists themselves. “Non finito,” or intentionally unfinished, works are also thoughtfully considered. I’ve been drawn to this approach for a long time. In the mid-nineties, while in grad school, I glommed on to the fragmented drawings in Leonardo’s sketchbooks and began making paintings with fractured, isolated imagery. Later, Gilbert Stuart’s unfinished portrait of George Washington, painted in 1796 and on display at the National Portrait Gallery in Washington, reinforced my interest in gestures of the incomplete. I wondered what a painting that valued beginnings over resolution might look like. In 2010, I painted small fragments on large canvases rather than covering the entire swath of fabric. These ideas informed my thinking about Casualism, which is related though may not always include elements of incompleteness. Somewhat paradoxically, leaving a painting unfinished isn’t as easy as it sounds. It involves determining the inherent value of beginnings and missteps when painting orthodoxy would cast them merely as transitory means to a better end. From this perspective, all the work in this show – whether or not the artist was making aesthetic, conceptual, or practical choices – resonates. Meaning and value reside in the story behind the process. Furthermore, on a formal level, the contrast between finished and unfinished is always visually striking. Finally, it is emotionally gratifying that so many orphaned artworks that reveal the vulnerability of their making, long considered unworthy, are finally getting some love. Other critics (Ben Davis, Roberta Smith, Holland Cotter) have moaned that the show – comprising 197 objects, 40 percent of which have been culled from the Met’s collection – could have been more culturally diverse. That’s probably true here, as it usually is. Most likely the Met’s collection does include far more unfinished objects than those on display, over a broader cultural range. I think the curators have also missed an opportunity to put Provisional/Casualist painting in a broader historical context. 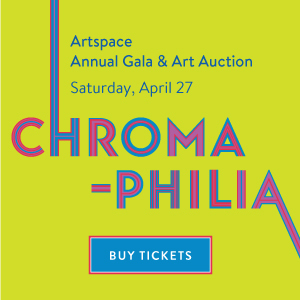 Work by Richard Tuttle, Michael Krebber, Cordy Ryman, Mary Heilmann, Raoul De Keyser, or Gedy Siboni would certainly have been a better fit than the paintings by, say, Brice Marden, Luc Tuymans, and Andy Warhol. Rachel Harrison’s constructions would have looked good, too. But despite its narrow focus and absence of timely work by contemporary artists, the show speaks articulately both to the process of making art and to the question of irresolution that artists are wrestling with today. It certainly fulfills the Met Breuer’s mission of seeing contemporary art through the lens of art history. For this reason alone, the exhibition is a must-see. 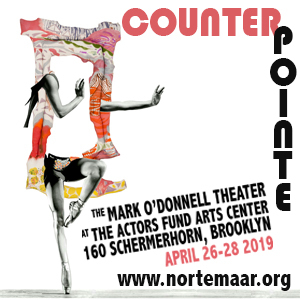 It may signify that the question “When do you know when a painting is done?” is finally yielding to a conversation about the process – not the product. Michelangelo Buonarroti (Italian, Caprese 1475–1564 Rome, studies for the figure of the Libyan sibyl on the northeast end of the Sistine Chapel ceiling, ca. 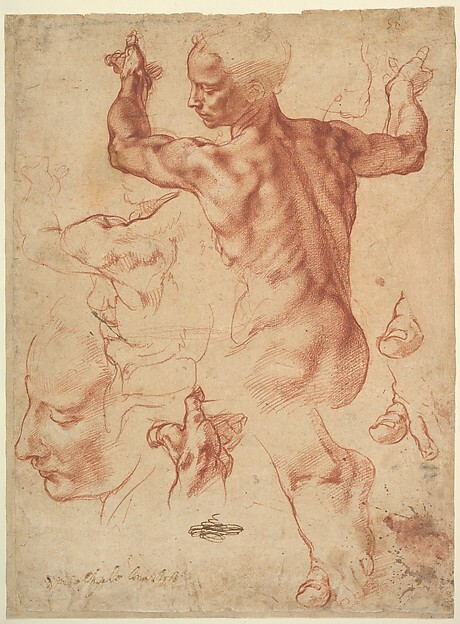 1510–11, red chalk, with small accents of white chalk on the left shoulder of the figure in the main study (recto); soft black chalk, or less probably charcoal (verso). In his studies, Michelangelo often left portions of the figure incomplete, and the practice had an enormous influence on later artists, such as Rodin. Follower of Giovanni Battista Cima da Conegliano (Italian, Conegliano ca. 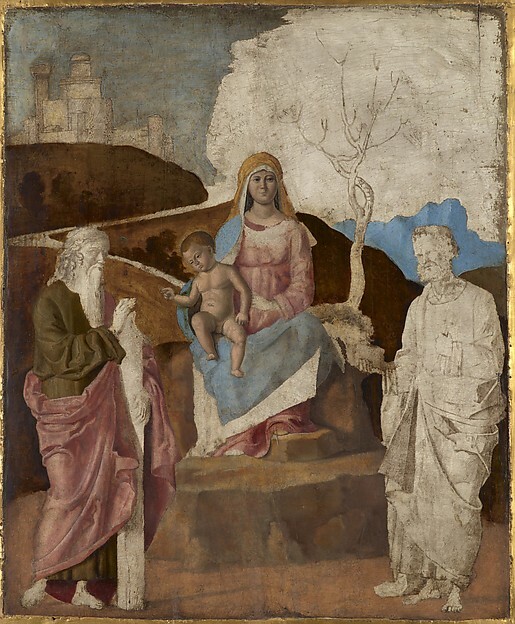 1459–1517/18 Venice or Conegliano), The Virgin and Child with Saint Andrew and Saint Peter (unfinished), late 15th or early 16th century, oil on wood. No one knows why this panel wasn’t completed, but it offers important insight into painting practice of the 16th century. To the contemporary eye, it looks pretty fresh as is. Titian (Tiziano Vecellio) (Italian, Pieve di Cadore ca. 1485/90?–1576 Venice), The Agony in the Garden, 1558–1562, oil on canvas. 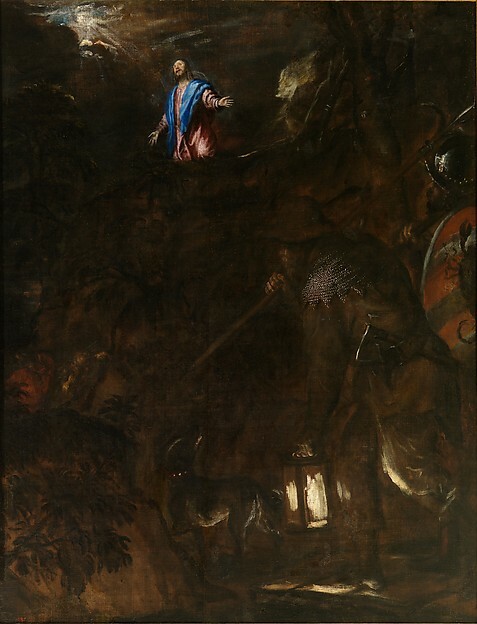 The facile brushstrokes seem quickly laid down and the finish less refined than Titian’s other work, giving the painting a sketch-like, unfinished quality akin to paintings from the Modern era. Jan van Eyck (Netherlandish, Maaseik ca. 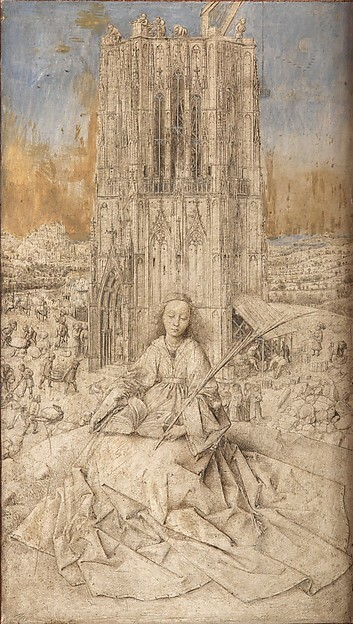 1390–1441 Bruges), Saint Barbara, 1437; metalpoint, brush drawing, and oil on wood. This gem, the oldest work in the show, is signed and dated, so it’s unclear if van Eyck made it as a preparation for a painting, or whether it’s just an unusual, partially- colored drawing. Édouard Manet (French, Paris 1832–1883 Paris), Madame Édouard Manet (Suzanne Leenhoff, 1830–1906), ca.1873, oil on canvas. 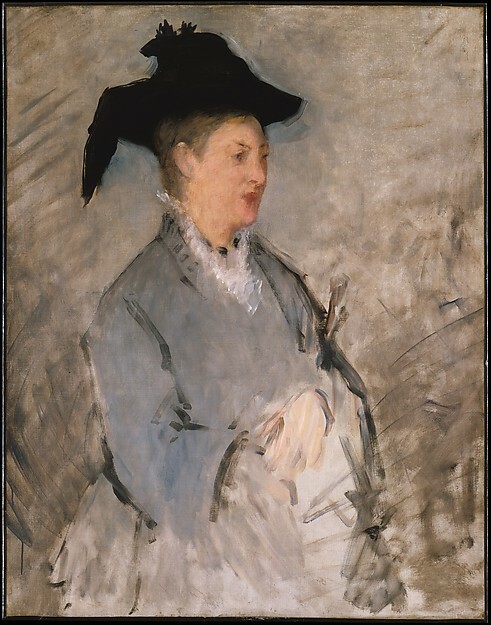 Apparently Manet painted six portraits of his wife, but he was never happy with this one. He scraped and repainted the face at least twice before moving on the other things. 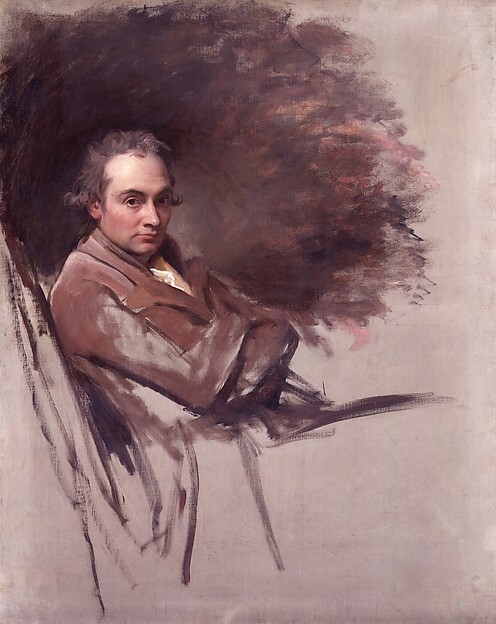 George Romney (British, Beckside, Lancashire 1734–1802 Kendal, Cumbria), George Romney, 1784, oil on canvas. All the unfinished portraits in the exhibition provide a fascinating window into the artists’ working process. 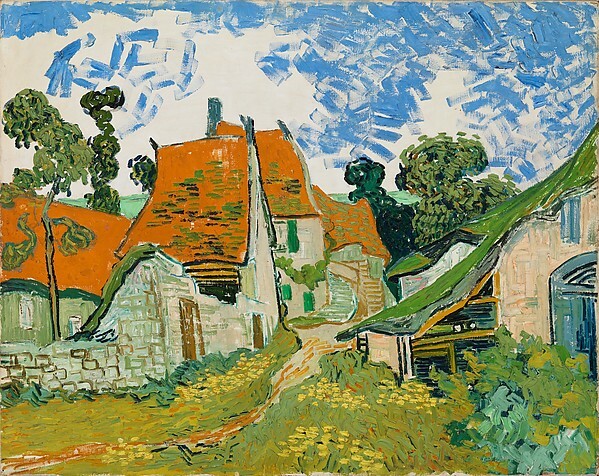 Vincent van Gogh (Dutch, Zundert 1853–1890 Auvers-sur-Oise), Street in Auvers-sur-Oise, 1890, oil on canvas. Van Gogh shot himself in July 1980, so we don’t know if this seemingly unfinished painting was a preparatory study for another painting, or if the unfinished sky can be interpreted as an indicator of his troubled emotional state. 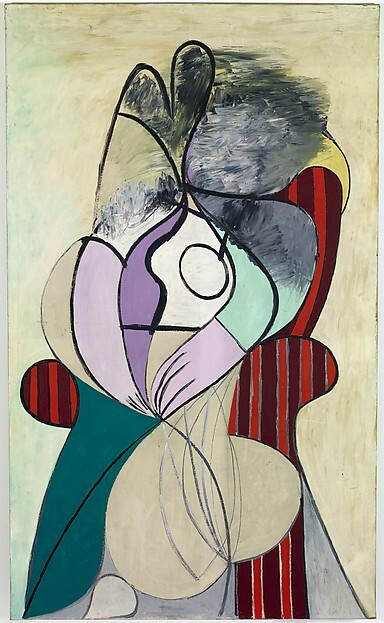 Pablo Picasso (Spanish, Malaga 1881–1973 Mougins, France), Woman in a Red Armchair, 1931, oil on canvas. Private collection. Courtesy Fundación Almine y Bernard Ruiz-Picasso para el Arte (FABA), Madrid © 2016 Estate of Pablo Picasso / Artists Rights Society (ARS), New York. Image © FABA, photograph: Marc Domage. This is the first time this painting, said to be of his teenage mistress Marie-Thérèse Walter, has been shown in a public exhibition. 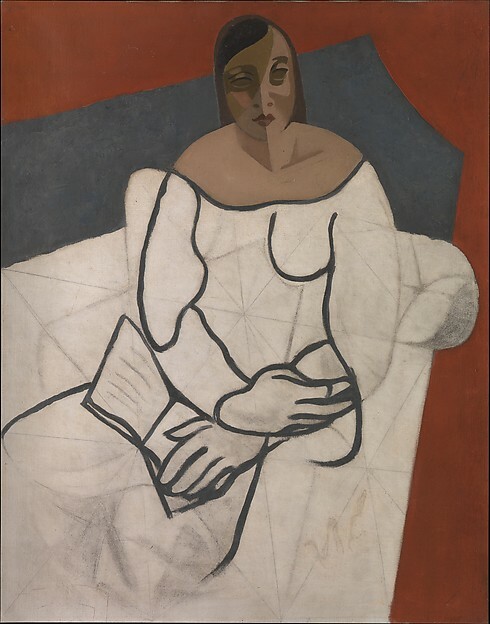 The curators suggest that the agitated grey brushwork on the face references the tension their relationship caused between Picasso and his first wife Olga. 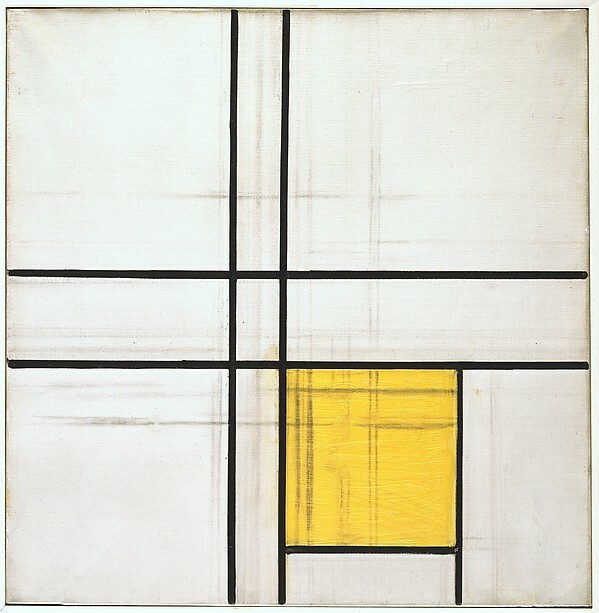 Piet Mondrian (Dutch, Amersfoort 1872–1944 New York), Composition with Double Lines and Yellow (unfinished), 1934, oil and charcoal on canvas. Mondrian’s letters from early 1935 suggest that illness prevented him from finishing many of the paintings he had started. On this one, the pencil lines indicate alternate directions that were never realized. 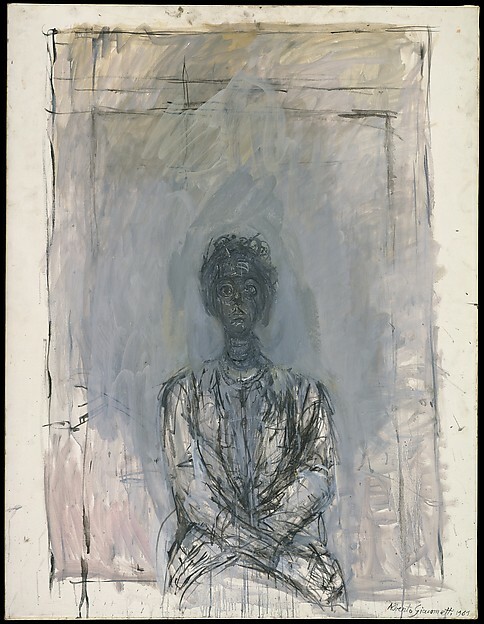 Alberto Giacometti (Swiss, Borgonovo 1901–1966 Chur), Annette, 1961, oil on canvas. Giacometti never regarded any of his pieces as finished. He obsessively reworked them, even after they had been in exhibitions. 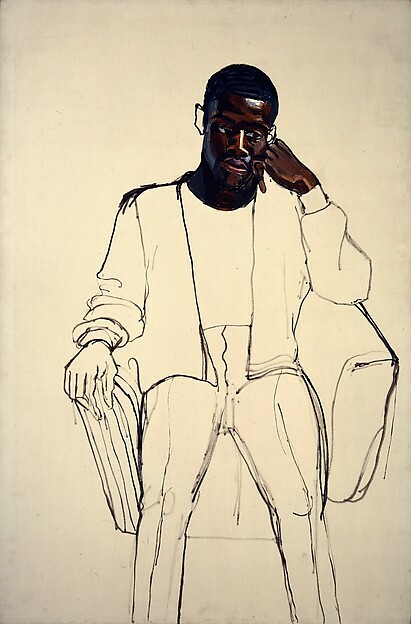 Alice Neel, James Hunter Black Draftee, 1965, oil on canvas. COMMA Foundation, Belgium, © The Estate of Alice Neel. This poor guy left for the Viet Nam War and never came back for a second sitting, but Neel considered it finished nonetheless. She included it in her 1974 Whitney retrospective. 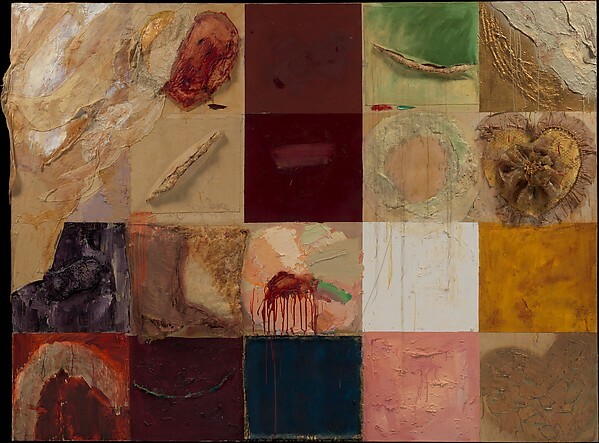 Joan Snyder (American, born Brooklyn, New York 1940), Heart On, 1975 oil, acrylic, paper, fabric, cheesecloth, papier maché, mattress batting, and thread on canvas. Gift of Mr. and Mrs. Donald Rugoff, 1981. In the 1970s and 80s, painters liked revealing their process by leaving earlier stages of the paintings visible through the thin washes of paint. 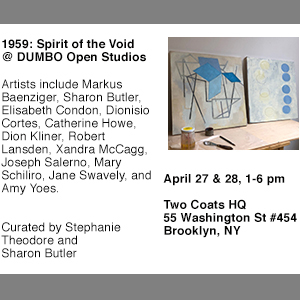 “Unfinished: Thoughts Left Visible,” curated by Andrea Bayer, Kelly Baum, Nicholas Cullinan under the direction of Sheena Wagstaff. The Metropolitan Museum of Art, New York, NY. Through September 4, 2016. The exhibition is accompanied by a 336-page fully illustrated catalogue and the website includes images of (and information about) all the pieces in the show.